Another Monday, another dollar. I hope everyone had a lovely weekend! I had lunch with some friends at a Korean restaurant, took a nap, and ran some errands here and there. I also obsessively searched for a pair of d'Orsay pointed flats, but to no avail. I'll have to continue looking until I find a pair that I like. 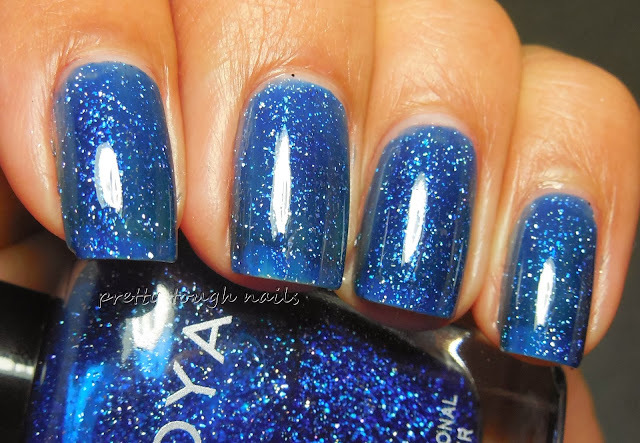 Today's swatch is Zoya Dream, from the newest holiday collection called Zenith. It's a navy blue jelly version of their scattered holographic polishes that applied with total ease. The jelly finish gives the polish a squishy appearance, and although two layers looked opaque to me, it appears semi-translucent on camera. In retrospect I should have done three layers because it would add extra holographic particles for some additional rainbow factor. 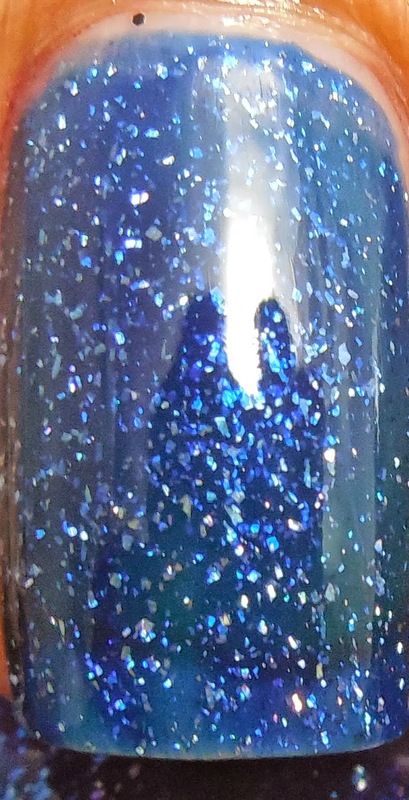 The blue isn't necessarily navy either, it's more like a dark cobalt blue that is enhanced by the holographic flakes. Looking at this mani is like looking into a twinkling night sky full of stars. I finished this with a layer of NYC GCS. I took most of these pictures under direct light instead of using the light tent - for some reason the camera didn't want to focus under the tent and I think the direct light made it easier to capture the holographic flakes. This shade of blue is truly perfect for its name Dream because it's what I'd imagine seeing overhead when lying in bed. I hope that Zoya continues making more colors with this kind of finish because I can never get enough! I LOVE this polish! I'm super jealous and I want it too! Hopefully there will be a sale soon!! This is gorgeous! It reminds me of a starry night sky too. I love it. Sadly this is the only starry sky I can see while living in smoggy LA!